Decimal number is repetitively divided by eight and remainders are arranged in the form of octal numbers. 2. Convert (356)10 into octal. Conversions from Octal to Decimal. Each octal is multiplied by its weighted position. The sum of all products is known as decimal form of octal. The three digit format of binary digits is used for octal to binary conversions or vice-versa. 3-bits binary numbers are written for each octal digit. Convert (56)8 (octal) into binary. Convert each octal digit into binary and make three digits grouping. Convert (64102)8 into Binary number. The binary numbers are broken into 3-bits section from last bit and convert into octal equivalent of each binary section. Table shows the decimal, octal and equivalent binary bits. Convert (10011)2 into octal number. Make 3-bits grouping from last bit. Convert each group into decimal numbers. Convert (1011010011)2 into octal number. make groups of 4-bits from last bit. Make a four digits group from the last bit of the binary number. The number with base eight is called octal number. It is represented by Q or O. When decimal number is repetitively divided by eight and remainders are arranged in the form of octal numbers,then decimal number are converted into octal. The three digit format of binary digits is used for octal to binary conversions or vice versa. 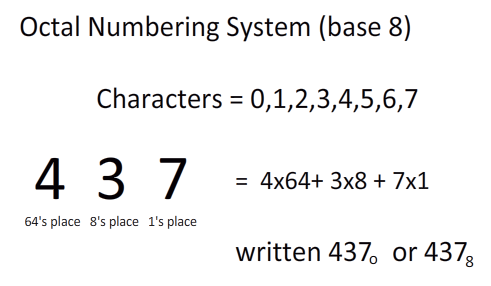 A number system that uses eight different digits to represent different values is known as octal number system. The base of octal number system is 8 because it consist eight digits from 0 to 7. The octal number system is used in the computer to represent binary numbers. The place values in the octal number can be expressed by using powers of 8. How can we convert octal into decimal? The procedure for conversion of octal numbers to their decimal equivalents is similar to conversion of binary numbers to their decimal equivalents but with the difference, that the base used in this case is 8 instead of 2 used in binary. How can we convert octal into binary? Octal digit is represented in 3 bits. An octal number is converted to its binary equivalent by just substituting the respective binary value for each digit of the octal number. How can we convert octal into hexadecimal? There is no any direct method to convert octal number into octal. So, at first the given octal number is converted into its binary equivalent then the result will be converted into hexadecimal as in previous methods. The number with base eight is called ______. What is the octal value of the binary number 101110? What is the octal value of the binary number 1011010011? What is the binary value of the octal number 64? What is the binary value of the octal number 63? What is the hexadecimal value of the octal number 34765? The base of octal number system is ______. Any Questions on 'Octal Number System '?